(AP) -- New tremors at Alaska's Mount Redoubt are prompting speculation that the volcano could be in a phase that will lead to more instability. The 10,200-foot volcano erupted six times Sunday and Monday, spewing clouds of gritty ash high into the sky. A volcanologist at the Alaska Volcano Observatory said Tuesday that Redoubt was exhibiting activity that could indicate it is creating a formation called a lava dome. Volcanologist Peter Cervelli said such a formation can collapse, creating more ash plumes and mudflows. The eruptions so far have sent clouds of the abrasive ash drifting across communities north of Anchorage. Cervelli says the eruptions also triggered 22-mile volcanic mudflows. Redoubt is roughly 100 miles southwest of Anchorage. WILLOW, Alaska (AP) - Rita Jackson said she was taking a sip of coffee when she tasted something funny on her lips - ash. 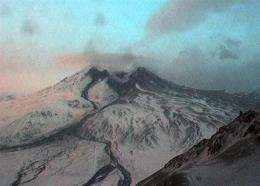 Alaska's Mount Redoubt's first cluster of eruptions in nearly 20 years - a total of six were detected between Sunday night and Monday night - sent a volcanic ash plume more than 9 miles into the air and down into nooks and crannies. Ash missed the state's largest city, but dusted small communities north of Anchorage. The National Weather Service had an ash advisory in effect until 5 a.m. Tuesday for the Susitna Valley. There were no reported injuries. The wind took ash away from Anchorage, toward Willow and Talkeetna, near Mount McKinley, North America's largest mountain. Jackson, in Willow, was experiencing other effects, in addition to ruined coffee. "My eyes are itching really bad," she said as she hurried to get out of a grocery store to drape protective blue tarps over a motorcycle, snowmobile and vehicles. The Alaska Volcano Observatory reports that the sixth eruption came at 7:41 p.m. Monday. The five earlier eruptions came late Sunday night into Monday morning. Based on Mount Redoubt's historical patterns, this activity could continue for weeks or months, Interior Secretary Ken Salazar said during a teleconference Monday. Alaskans had been warned of a pending eruption of the volcano about 100 miles southwest of Anchorage since it became restless in late January. People stocked up on masks, air filters and disaster supplies. Eight Australians on a backcountry tour holed up in Shell Lake Lodge near Skwentna, about 100 miles northwest of Anchorage, waiting for the ash to settle. "It's a good half inch, it's a pretty heavy dusting," Craig Saunders, a Palmer man leading the group on an eight-day snowmobile tour of the Alaska wilds, said Monday. Ash from Alaska's volcanos is like a rock fragment with jagged edges and has been used as an industrial abrasive. It can injure skin, eyes and breathing passages. The young, the elderly and people with respiratory problems are especially susceptible to ash-related health problems. Ash can also cause damage engines in planes, cars and other vehicles. "Anyone with a pre-existing respiratory problem is advised to stay indoors until the ash settles. If you do need to go out, a mask is recommended," said Dr. Jay Butler, chief medical officer for the state of Alaska. Some flights were canceled, leaving some state senators unable to fly into Juneau, and delaying consideration of a resolution accepting federal stimulus funds. Elmendorf Air Force Base in Anchorage kept 60 planes, including fighter jets, cargo aircraft and a 747 commercial plane, in shelters. Small planes also could be affected. Barry Stanley, owner of Denali Flying Service in Willow, canceled three flights flying supplies to the Finger Lake area west of Willow on Monday because of the ash. "You can't fly in this stuff," he said. "Ash is too risky to risk damaging your equipment. I'm not making money if I ruin my stuff." Jackson, 56, got an unexpected day off when her employer told her to stay home. She said that if she had time to walk her 7-year-old dog, Lola, "I'll put her motorcycle goggles on her." Some residents didn't even notice the ash at first. "I just thought it was snow," said Pat Walsh, who moved to Trapper Creek near Talkeetna after retiring as a police officer in Tucson, Ariz.